Get the free Ameriprise app and get on-the-go access to your accounts and your advisor. So no matter where your journey takes you, you can be confident knowing we're with you. The Ameriprise app connects you with the information you need – when you need it – to help you make smart, informed financial decisions. Yes. The Ameriprise app is covered by safeguards similar to those we use to protect your privacy and security online. To access your account information and take full advantage of the Ameriprise app, you must be a registered user of the secure site on ameriprise.com, our secure client site. Registration is quick and gives you access to a full range of account management features and benefits. Plus, your username and password for the secure site on ameriprise.com will be the same for logging into the Ameriprise app. 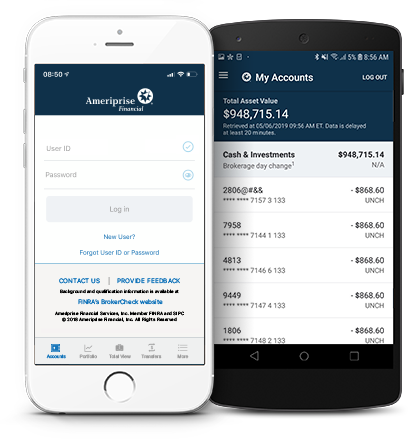 The Ameriprise app is available for iPhone and Android devices. To install, search for "Ameriprise" in the respective app store. Android is a trademark of Google, Inc. Use of this trademark is subject to Google Permissions. Investment products are not federally or FDIC insured, are not guaranteed by any financial institution, and involve investment risks including possible loss of principal and fluctuation in value.